Flowing Gardens by GroundLab, the winning master plan in a competition for the International Horticultural Expo, will open this spring. If Ground Zero were up for grabs today would Michael Van Valkenburgh be a more likely candidate for master planner than Daniel Libeskind? It’s plausible. The recent surge in prestigious commissions going to and being completed by landscape architects has fuelled a fiery discourse over the ether as well as in academic circles as to what this means for the way cities will be made in the future. Traditionally, the architect was the master builder with landscape designers as mere ancillaries. Today that relationship is fast being reversed. Indeed, commissions that might have been won by architect-led teams just a few years ago are now going to landscape firms. And large-scale urban design competitions are going to landscape-led teams who demonstrate the capacity to design creatively with existing ecologies, such as the redevelopment of Seattle's waterfront by Field Operations, or urban regeneration initiatives like Gateway Arch in St. Louis, which aims to reinvigorate Eero Saarinen's iconic landmark through improved public areas by Michael Van Valkenburgh Associates (MVVA). GroundLab's Deep Ground master plan reenvisions the urban fabric of Longgang Municipality in Shenzen, China (left) and a rendering of an overlook structure for Hunters Point South, New York City designed by Thomas Balsley Associates and Weiss/Manfredi (right). Charles Waldheim, head of landscape architecture at the Harvard Graduate School of Design, cites the Lower Don Lands project as exemplary of a decreasing emphasis on disciplinary boundaries and an increasing appreciation for ecological design, “MVVA assembled a very complex, multidisciplinary team,” he said in an interview. “Landscape urbanists have all the pieces.” As interest in ecological design grows, the need for landscape architects to deal with issues that architects aren't trained for also increases. “Landscape urbanism emerged to fill a void because planning and urban design had not provided an alternative,” said Waldheim, who has been a key proponent in bringing landscape urbanism to the fore and expanding the definitions of landscape architecture. According to Waldheim, the emergence of this faction of ecological designers snapping up high-profile projects is not a coincidence but rather the result of cumulative conditions. In the late 20th century urban design was committed to recreating the 19th century shape of the city, he argues, in order to reinstate environmental and social values, while urban planners withdrew from physical planning to focus on demographics and social science. The perceived primacy of cars and demands for an expanded transport infrastructure in the 20th century pushed cities further out into sprawl and placed automobiles and traffic control at the center of city design. Later, during the 1990s, architects felt there was no option in which designers could be culturally progressive and simultaneously engaged with environmental or social concerns, leaving a dissatisfied subset of designers keen to reconcile the two. Enter landscape urbanism, a term attributed by many to Waldheim, and certainly propagated by him. In any case, landscape urbanists are being recognized as key choreographers of urban space and they are beginning to subsume many of the roles once held by architects, planners, and urban designers. 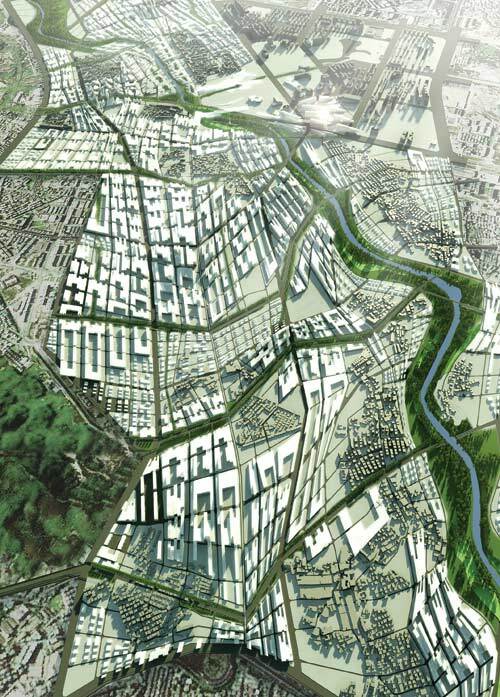 One such practice is London-based landscape architects GroundLab whose project Deep Ground recently won a competition to master plan a 4.6-square-mile area of Longgang in Shenzhen, China, drawing on urban design, planning, and environmental remediation to make a comprehensive, connected urban scene. 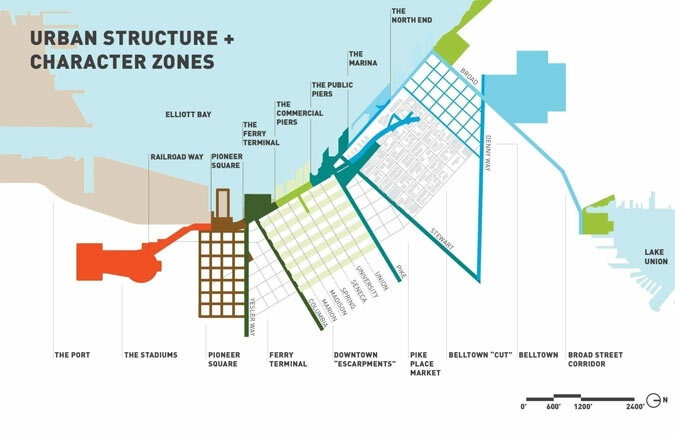 James Corner Field Operations' scheme for Seattle's waterfront redevelopment covers nine acres. That's not to say that architects will be rendered powerless, but it does mean that they may have to cede total control, shedding the idea of sole authorship and autobiographical building and instead re-cognizing those others with more skill sets relevant to a given project. In Toronto, Michael Van Valkenburgh Associates (MVVA) won a competition to reimagine the relationship of the Don River to the city (top). 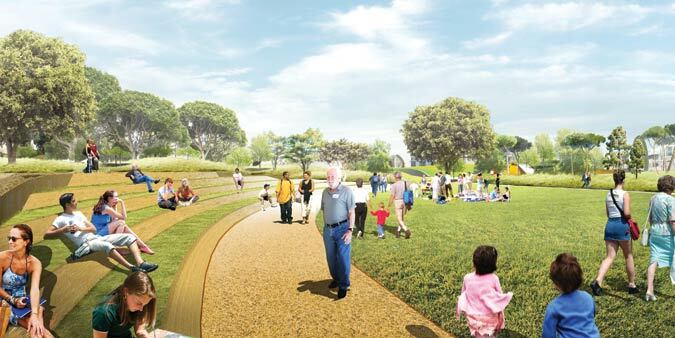 MVVA is also leading a team in the redesign of the park surrounding the Gateway Arch in St. Louis (above). As designers across the profession are increasingly faced with challenges that don't have a precedent and don’t correspond to traditional disciplinary boundaries, such as rising water levels, post-industrial cityscapes, waste, and a crippled climate, practices are repackaging and restructuring themselves in response. But the prospect of another professional group— particularly landscape architects—ascending to a decision-making role in the built environment still makes some squirm. 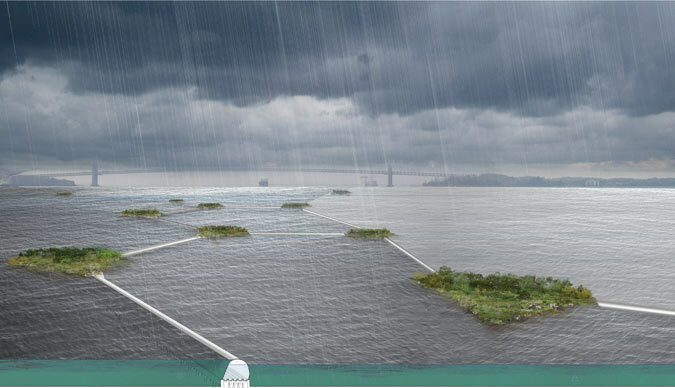 For MoMA's 2010 Rising Currents show, nArchitects' New Aqueous City proposed a series of man-made islands (top) and floating piers (above). Indeed, the rise of landscape urbanism hasn't escaped public interest with interviews and articles in the national papers as well as on blogs. This kind of attention has propelled it from an academic discussion into a wider discourse, which, says Marton, is important to changing the very structure of design practice and ultimately municipal authority processes as well. Though the change is slow, there are solid examples of it happening. 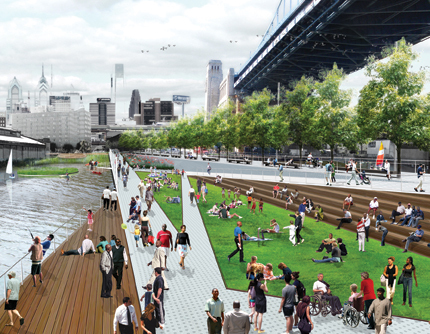 Philadelphia's long-awaited waterfront redesign recently shifted gears as it dropped plans for multi-story blocks and moved away from using a signature project to jump-start the city's master plan. 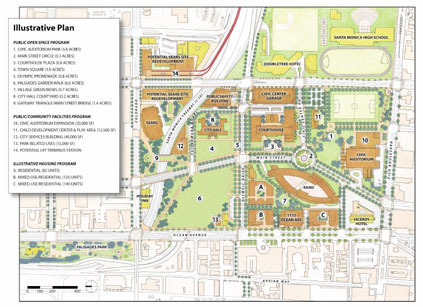 Instead, the massive plan focuses on a string of parks as a stimulus for continued development. Landscape architect James Corner of Field Operations is fitting his practice to the new mold. And while he had to struggle to get credit from architects on the immensely popular re-imagining of the High Line in New York, he is now leading a $569 million project to reconnect Seattle to Elliott Bay and create nine acres of new public space, a kind of prototypical antidote to the narrow commercialized waterfronts so common to many other U.S. cities. “There is a desperate need for a different kind of professional who is capable of seeing a bigger picture and choreographing a bigger team,” Corner told Metropolis in 2008. Meanwhile at the GSD, Waldheim's newly appointed staff in the Landscape Architecture department is dedicated to building a trans-disciplinary faculty including ARO architect Cassell, who will be teaching this year alongside Susannah Drake of dlandstudio. 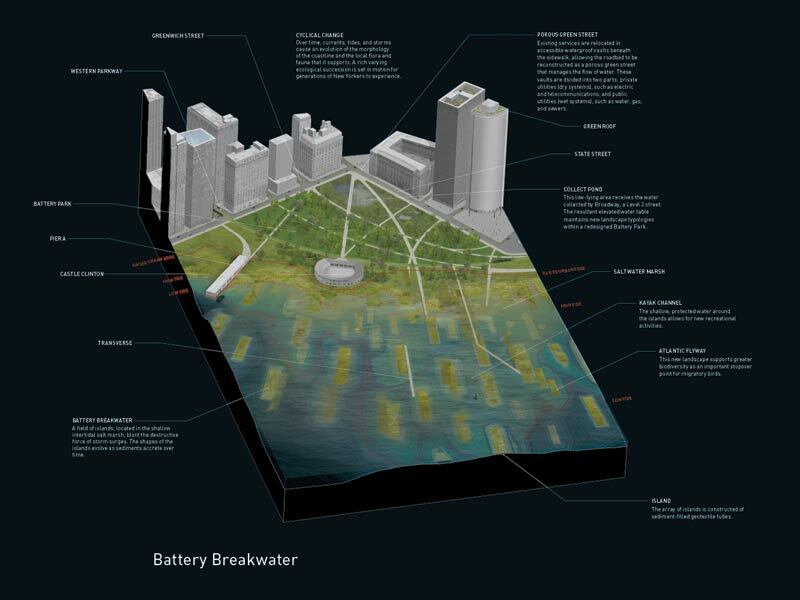 ARO and DLANDSTUDIO's proposal for MoMA's Rising Currents exhibition. 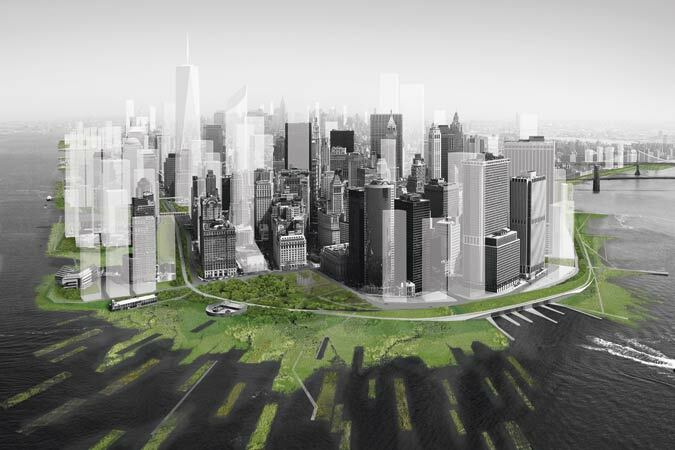 The project for New York's Waterfront creates a New Urban Ground of marshes and wetlands to protect against storm surges. Cassell and Drake have partnered before at the “Rising Currents” exhibition last year at the Museum of Modern Art. That path-breaking exhibition challenged architects to respond to an environmental catastrophe and called for “soft” infrastructures and ecological design solutions, bringing architects and specialists in ecological design together in close and productive collaborative efforts that attracted the close attention of developers and city officials alike. 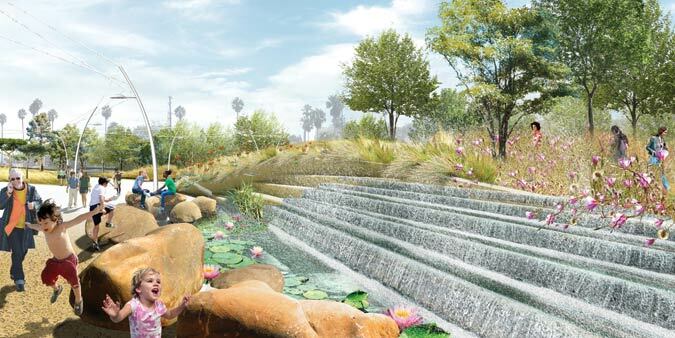 For his Rising Currents project, Eric Bunge of nArchitects composed his team of designers with various skill sets including Mathur/da Cunha as water specialist. Like the other collaborative teams that were formed for the exhibition, his suggests that in the future it won’t take a constructed disaster scenario to make architects realize the value of landscape designers. Columbia University looks as though it's in the final stretch of the public review process for the proposed Boathouse Marsh designed by James Corner Field Operations and the Steven Holl-designed Campbell Sports Center. On Friday night and Sunday afternoon, Columbia University Executive VP Joseph Ienuso made presentations to neighborhood residents. A few media outlets dubbed the gatherings "dueling meetings," due to some political infighting between council members Robert Jackson and Ydanis Rodriguez, which erupted during a subcommittee meeting before the city council last week. The background political drama only heightened already-tense negotiations between the neighbors and the university. The City Planning Commission green-lighted the project on February 16. The proposed 47,700 square foot Campbell Sports Center building sits on a riverfront lot. The university is required by law to devote 15 percent of waterfront property to public access. But instead, the university asked that Field Operations spruce up adjacent wetlands on city-owned land in Inwood Hill Park and offered 10 percent of the university land for public use, arguing that the university can barely squeeze in fields for football, baseball, softball, soccer, and field hockey, as well as six indoor tennis courts and two boathouses. For their part, Columbia has put an "action plan" in writing that promises to deed the boathouse dock to the city and develop children programs that teach rowing. The eight-point plan focuses primarily on access to the facilities, but also emphasizes getting on the water, a timely point that found its way into the recently released NYC Comprehensive Waterfront Plan released last week. Several rowers who spoke at both meetings, apparently got Jackson's ear. The councilman plans to meet with them early this week. The rowers are pushing for another item to be added to the action agenda: a place to store boats. The deadline for council approval or disapproval is April 6. Despite recently losing out to Downtown LA for Eli Broad’s new museum, Santa Monica still has a very high profile design project moving forward: the Palisades Garden Walk and Town Square. Located on seven acres of land between Santa Monica City Hall and the Santa Monica Pier, the $25 million project, which is being designed by James Corner Field Operations, was shared at its sixth and final workshop with the Santa Monica community on February 26. A site plan showing the art-deco City Hall at top left. As AN reported, Field Operations—the architects of New York’s High Line, among other high profile parks across the country—won the commission over a year ago, beating out teams like Gehry Partners and Peter Walker and Partners. Their highly ambitious, layered proposal will be broken up into a number of “systems,” a collection of colorful and topographically diverse zones, each meant for a different use and experience. That will include view-centric hills, sheltered bays, and meandering pathways surrounded by plants, fountains, and small creeks. The Grand Bluff will afford the best views of the ocean and neighboring vicinity; the Garden Hill will include the widest variety of plant life on the site; the Gathering Hill is meant for congregation and relaxation; and the Discovery Bay will be a play area for both children and adults and will feature an area shaded by large trees that will contain extra large steel slides, forts, and other activities. 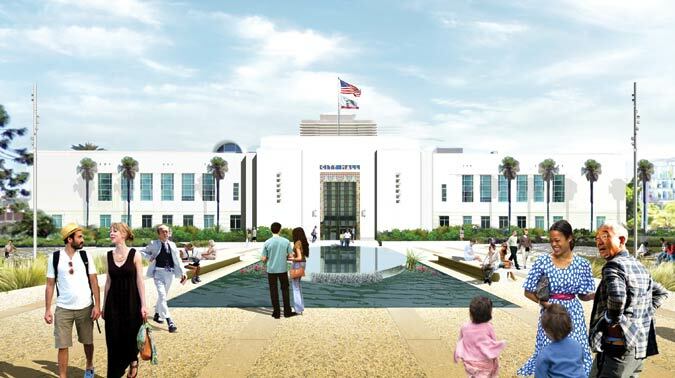 A community focal point will be the Town Square, a flat area with a large reflecting pool meant to defer to the art deco architecture (and landmark status) of Santa Monica’s City Hall. The Grand Bluff will afford the best views of the ocean and neighboring vicinity (top), the Gathering Hill is meant for congregation and relaxation (above, left), and the Discovery Bay will be a play area for both children and adults (above, right). The sinuous, braided, and often hilly project was inspired largely by the Arroyo Wash, a dried riverbed that once ran through the site. According to Switkin, plants will be plentiful and varied, an effort to diversify the city’s limited vegetation and to emphasize Southern California’s subtle seasons. 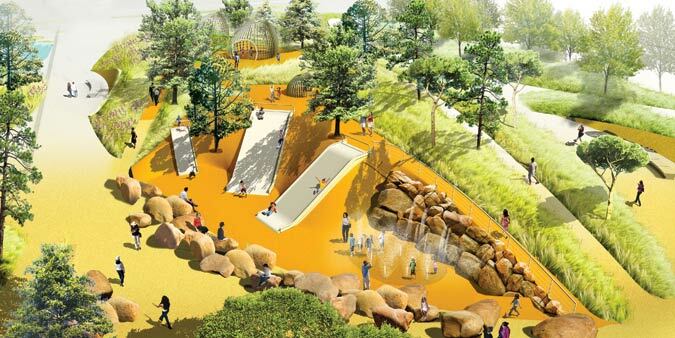 Trees will include Western Sycamores, Torre Pines, Ficus, Oaks, and Strawberries; and other plants will include four- to five-foot tall wild grasses, native wildflowers, and several types of succulents. The park is broken up into systems including a waterfall (top), the Town Square, a flat area with a large reflecting pool in front of City Hall (above, left), and meandering pathways surrounded by plants (above, right). In order to draw people in from a congested area near several major streets and even a freeway, the firm has created notable architectural elements. 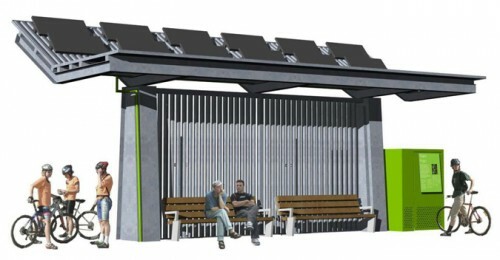 Most will be made of stainless steel slats and complemented with curved precast concrete benches. The most dramatic will be the large clamshell-shaped steel viewing platforms located on the Grand Bluff. “You have so many other attractions in Santa Monica. The Palisades Park, the Santa Monica Pier, and the Third Street Promenade. This begged for a new and unique identity,” pointed out Switkin. The project will go to the city council for a vote this June. Construction is expected to start next spring, with completion by spring 2013. Despite all the controversy surrounding bike lanes and cyclists elsewhere in the city, Fresh Kills South has adopted a rather pro bike stance (though who'd expect there to be much disagreement when the only other traffic to contend with is that of joggers, pedestrians, and bird watchers). New bike maintenance stations designed by James Corner Field Operations will eventually dot the landscape of the of the entire park, and their design nods equally to both the biker and the walker. The stations include vending machines selling bike repair products, like Allen wrenches and spare parts, on one side, and benches for weary bikers or pedestrians on the other. The benches made of torrefied (baked) wood are attached to a dividing wall made of galvanized steel two by fours spaced about six inches apart. These bike stations, along with new "comfort stations" (a.k.a. restrooms), will be off the grid, so solar panels atop the structures will provide the energy needed to power lights and equipment. Both structures feature lively lime green accents making them hard to miss in the landscape. The comfort stations sit on top of a concrete box that holds equipment for sorting sewage materials destined for composting. The structure also contains closets for maintenance equipment. The bathrooms themselves are simply prefab structures dropped into the envelope. While the new structures were designed with the new southern end of the park in mind, soon they will become the park standard. Apple takes another bite. 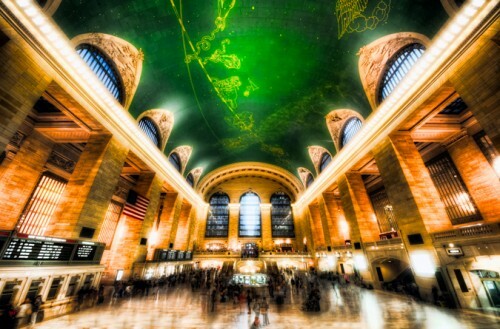 Once famous for its oysters, Grand Central will now be known for its Apples. Cult of Mac reports that the computer giant plans to open their biggest retail outlet yet, which will, no doubt be as busy as Grand Central Station. High speed posturing. If you don't want it, we'll take it! That's the message being sent out by Democratic governors to their Republican counterparts who are rejecting infrastructure dollars. Huff-Po's Sam Stein notes that governors from New York, Washington, and California are lining up to take Florida Governor Rick Scott's rejected $2 billion in federal funding for high speed rail line. Goal! One more hurdle to go. DNA reports that Columbia's Baker Field got the green light from the City Planning Commission to build the Steven Holl designed Campbell Sports Center. Part of the plan includes a James Corner/Field Operations-designed park and 17,000 square feet of restored marsh and shoreline. Pool Hall Banking. A 1916 bank building on Philadelphia's Chestnut Street will take on an adaptive reuse that its architect Horace Trumbauer surely never dreamed of. PlanPhilly reports that developer Paul Giegerich is thinking of turning the architect's two story cathedral of commerce into a swanky pool hall with food created by a star (Steven Starr to be exact). The new park and a surface boulevard will replace the Alaskan Way Viaduct, creating some 9 acres of new public space at the heart of the city's waterfront. 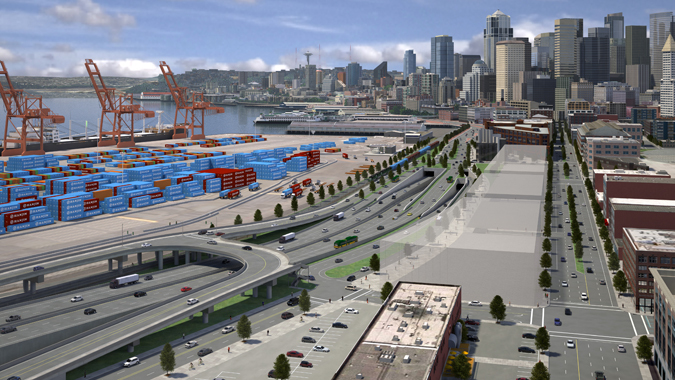 Seattle is one of the latest cities to take on a major revitalization of its postindustrial embankments. Last week, it selected James Corner Field Operations to take the lead in “transforming a gray and dreary transportation corridor into a vibrant, active, exciting public space,” as Karen Daubert, executive director of the Seattle Parks Foundation, described the task. The project, estimated at $569 million, will provide nine acres of open space, left when an elevated freeway along the city’s central waterfront is demolished. 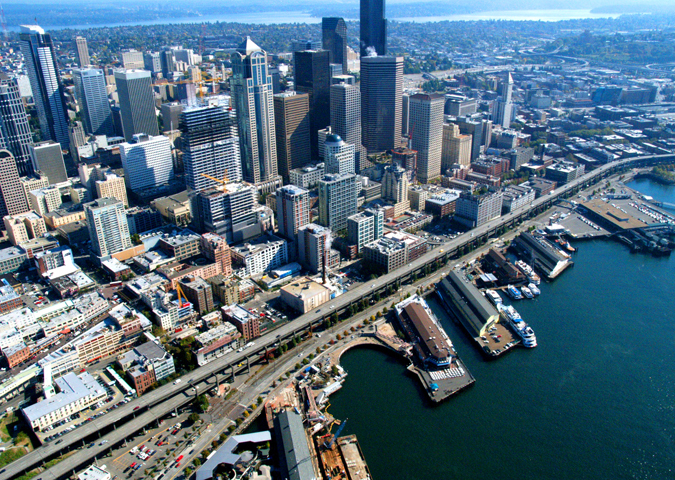 The Alaskan Way Viaduct, on the city's west side, is an imposing physical and visual barrier that planners have dreamed of removing for decades. 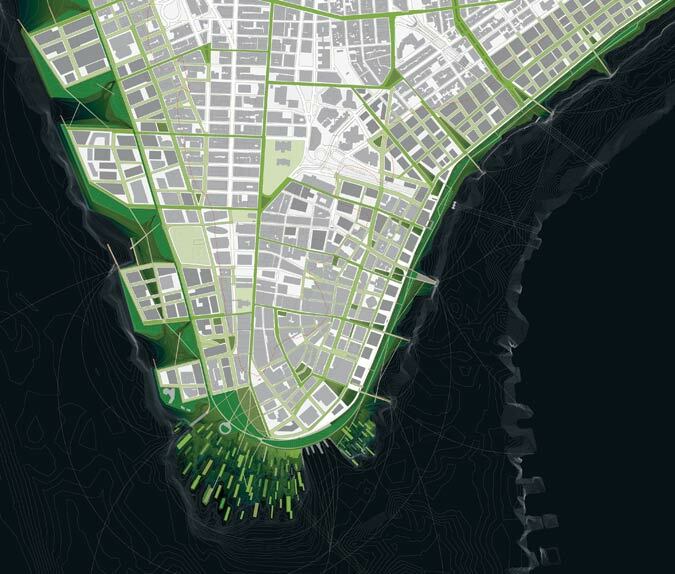 New York-based Field Operations, which specializes in landscape and urban design, led the design teams for the High Line and Fresh Kills Park in New York, and is working on a new civic park (also near the water) for the city of Santa Monica. The supporting cast includes NY-based SHoP Architects as well as Seattle firm Mithun. The team was selected from a shortlist of four, which also included Gustafson Guthrie Nichol, Michael Van Valkenburgh, and Wallace Roberts & Todd. WSDOT's early concept for the proposed new promenade, with pink areas showing space that can be designed with new public amenities. The park will depend on construction of an underground tunnel to replace the Alaskan Way viaduct, a $3.1 billion project funded by state and federal dollars and headed up by the Washington State Department of Transportation (WSDOT). The city has secured half of the park funds and is deciding how to acquire the rest. There will be no commercial development on the public property occupied by the viaduct. “We see this like the High Line in New York City, which is an excellent example of how public open space created opportunities for private development,” said Rick Sheridan, communications manager for the Seattle Department of Transportation. City officials have been clear on their stance against waterfront highrises. “We do not want this to become Miami Beach,” said councilwoman Sally Bagshaw. An early visualization of the tunnel's south portal, looking toward the city center. The concept will be developed as part of the project's design process. The city has issued an RFQ for the construction team and plans to announce its selection in October. The construction and design teams will work together on the design and be “joined at the hip for the entirety of the project,” said Sheridan. Conceptual designs are set for next year, construction is scheduled to begin in 2016, and the park is slated to be completed in 2018. 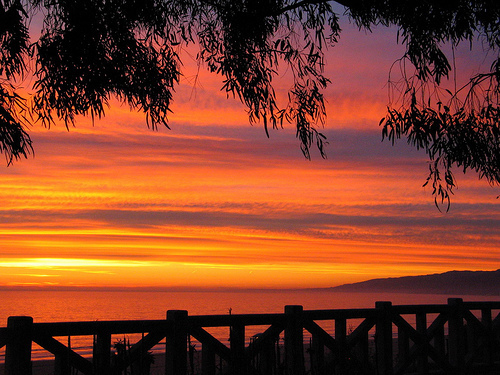 Field Operations will soon develop new plans for the Palisades, seen here at sunset, and Town Square in Santa Monica. James Corner and Field Operations have beaten out formidable competitors including Gehry Partners and Peter Walker to design Santa Monica’s new Palisades Garden Walk and Town Square. The high profile project will include 7 acres of park space between Santa Monica City Hall and the Santa Monica Pier that will connect the area’s Civic Center to the rest of the city. Land for the project was made available when the RAND Corporation relocated its headquarters to the southernmost location of its 15-acre site back in 2004. Out of the 24 teams that submitted for the RFQ, the six shortlisted teams included Field Operations, Peter Walker and Partners, Gehry Partners, Studio Works, Gustafson Guthrie Nichol, and SWA Group. The selection panel for the project included Qingyun Ma, Dean of the USC School of Architecture; landscape architect Ken Smith, and Marc Fisher, Campus Architect at UCSB. They panel coordinated with staff from the city’s Community and Cultural Services, Planning, and Public Works/Architecture Services departments. In the end Field Operations, best know for their work on New York’s High Line, won out because of their creative thinking about the site, their landscape expertise, their strong work in the public process, and their “commitment to making places for people,” said Barbara Stinchfield, Santa Monica’s Director of Community and Cultural Services. Teams did not present concept designs in their interviews. 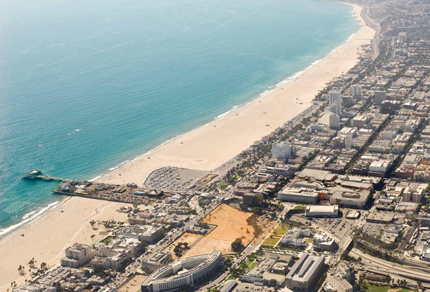 An aerial photograph shows the new areas to be developed by Field Operations in downtown Santa Monica as well as nearby landmarks. Lisa Switkin, an associate principal at Field Operations, believes it is her firm’s commitment to community involvement that helped it win the day. “We are good listeners,” she said. “We try to understand the site, not come in with a design and retrofit it to what people like.” Switkin added that while a design is far from being developed, the firm is interested in exploring the site’s historic significance, its local plant life, its bluffs and dunes, its significant grade changes, and even its nearby freeway interchange. “We like to amplify the site’s existing characteristics,” she said. 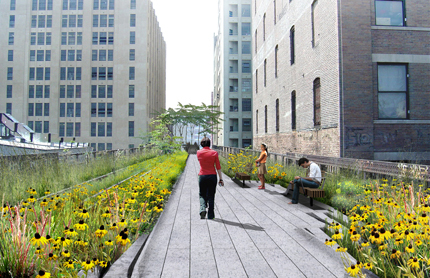 On the heels of the High Line, Field Operations is also working on major park spaces throughout the country. These include the Atlanta Beltline, a 22-mile loop of former rail tracks and embankments around the city; the huge Shelby Farms Park in Memphis; the Race Street Pier in Philadelphia; and the massive Fresh Kills Park on Staten Island, which is transforming the former landfill of the same name. Stinchfield said the project is being funded through $25 million in redevelopment agency funds, while the city hopes to tap into additional design department money. They hope to finalize the team’s contract and make a recommendation to the City Council at its last meeting in March. But Mulder thinks that the recommendation might not be made until the council’s April 13 meeting. From there, she said, the city hopes to have the design finalized by late 2011 or early 2012 and have construction begin in 2012. The Town Square portion of the project, adjacent to Santa Monica’s City Hall, is set to be a space for cultural and civic events, while the Palisades Garden Walk, to its south, will focus on the city’s unique “cultural” and “horticultural” offerings, including a botanical element and water features. Adjacent streetscape improvements, as well as pedestrian and bicycle paths, will connect the parks to the city, while Moore Ruble Yudell’s Santa Monica Village will sit just adjacent. We’re pretty built up at this point, so it’s definitely one of the last open spaces that we may have to develop for a long time,” said Mulder. A rendering of a new public space on the Race Street Pier, now being designed by James Corner Field Operations. 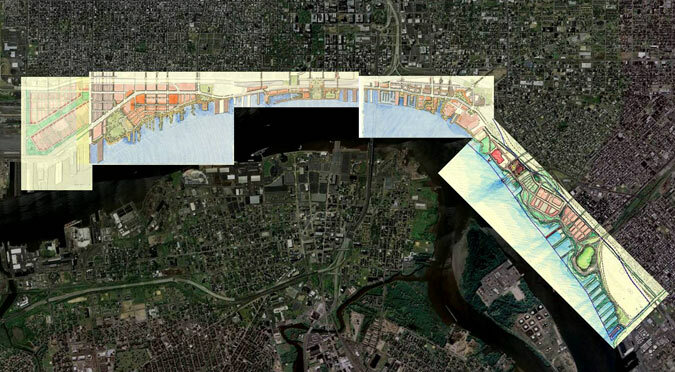 Late last year, the Delaware River Waterfront Corporation (DRWC) named New York–based Cooper, Robertson as part of the team to develop a masterplan for the area, along with landscape architecture firm Olin, architects KieranTimberlake, and economic analysts HR&A Advisors. 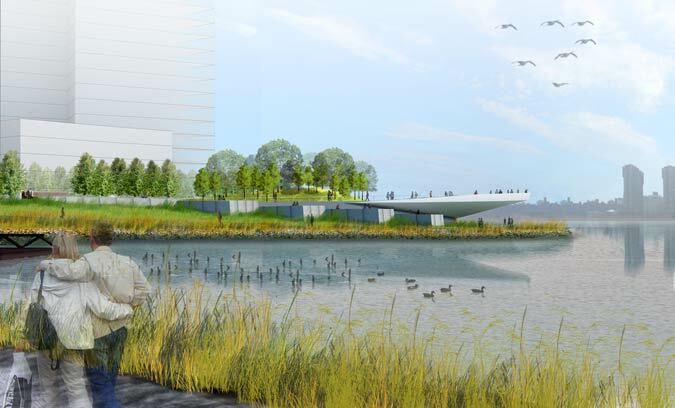 At the same time, the DRWC is charging ahead on designs for a pier near the Benjamin Franklin Bridge, plus a trail that will open public access to the long-blockaded riverfront. 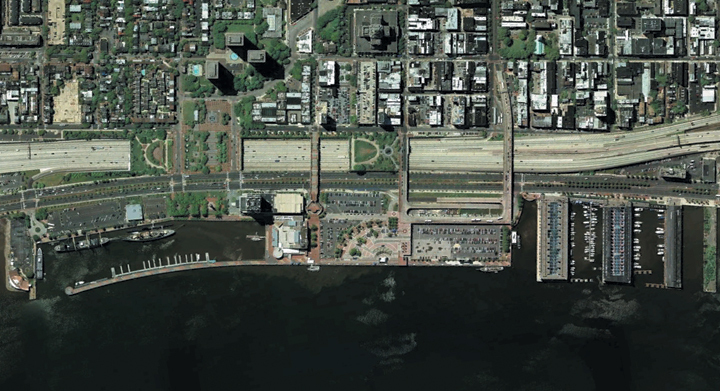 Cooper, Robertson will help plan a seven-mile stretch of the Delaware River waterfront in Philadelphia, most of it separated from the center city by I-95. In awarding the $1 million masterplan contract, the DRWC looked to the site’s industrial past as a key to its rebirth. “For waterfronts we’ve worked on, the predominant land use tends to be residential,” Cooper said. “People here are much more interested in job creation, and that’s tough in this economy.” Other challenges include the fact that 95 percent of waterfront parcels are privately owned, meaning that the team will likely pursue land swaps to facilitate the area’s redevelopment. Throughout the year-long process, Cooper will rely on Olin and KieranTimberlake, both based in Philadelphia, for their understanding of the site, which stretches from Allegheny to Oregon avenues and from the river to I-95. They’ll also need to anticipate a high-speed transit corridor on the water side of the highway, whose precise alignment is now being studied by federal officials. The rail line should help unify the waterfront and, with its spur into central Philadelphia, offer a needed link to the river. 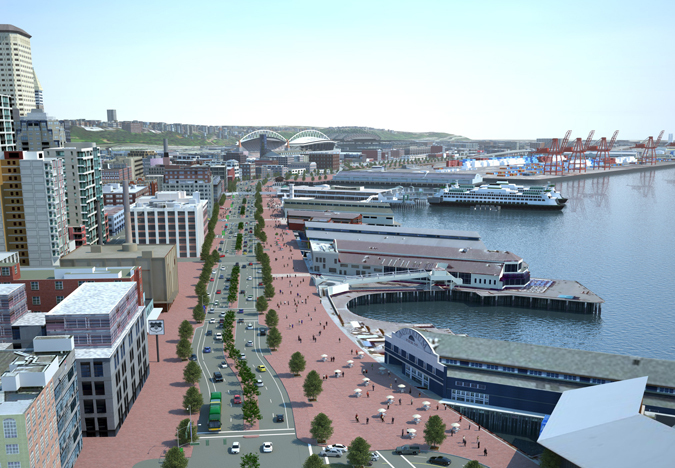 For now, projects on tap include James Corner Field Operations’ designs for Pier 11, now known as the Race Street Pier, expected to open by 2011. 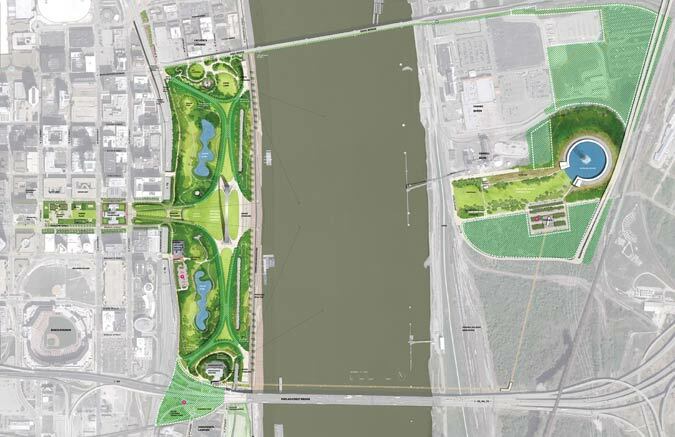 And design-build proposals are being studied for a parcel at Pier 53, linking to a trail that should increase access from South Philadelphia. That $570,000 project, which Thorp said will “clean and green” the pier’s upland area, is due to open this summer. The project is planned for the patch of land just north of the elliptical RAND building, at lower center. 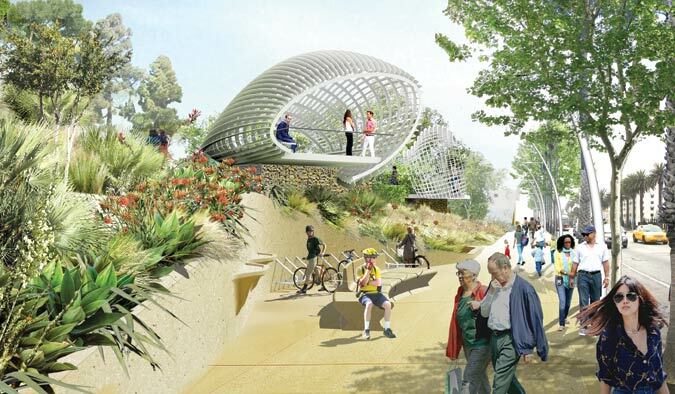 Yesterday, Santa Monica selected an impressive list of architects, landscape architects, and urban designers to create one of its most high-profile public projects ever: the Palisades Garden Walk and Town Square. 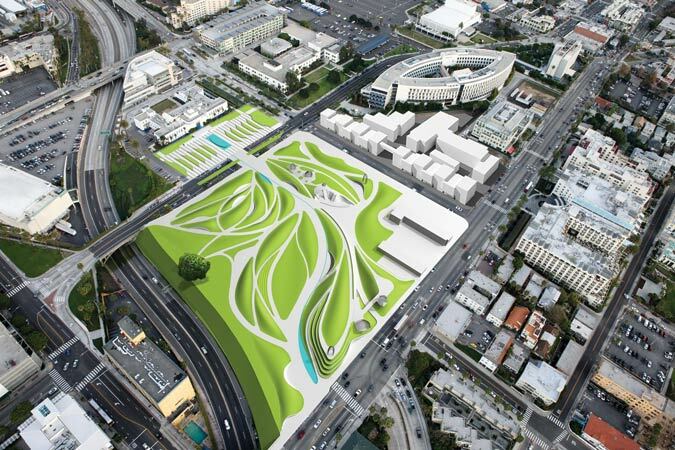 The project, currently a patch of dirt not far from the Pacific Ocean, will include 7 acres of park space between Santa Monica City Hall and the Santa Monica Pier that will be bordered by future residential development and connect the Santa Monica Civic Center to the rest of the city. Land for the project was made available when the RAND Corporation relocated its headquarters to the southernmost location of its 15-acre site in 2004. Of the 24 teams that submitted for the RFQ, the six shortlisted contenders are: Peter Walker and Partners, Gehry Partners, James Corner Field Operations, Studio Works, Gustafson Guthrie Nichol, and SWA Group. 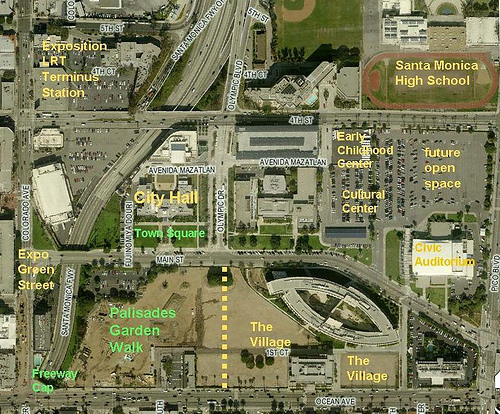 The park will become a central public space in downtown Santa Monica (click to enlarge). 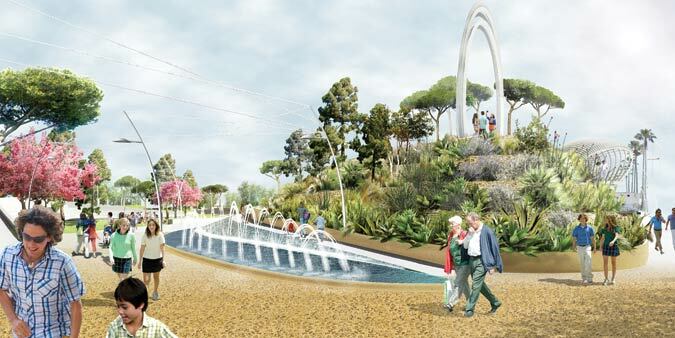 According to the project’s RFQ, the Town Square, adjacent to Santa Monica’s City Hall, is set to be a space for cultural and civic events, while the Palisades Garden Walk, to its south, will focus on the city’s unique “cultural” and “horticultural” offerings, including a botanical element and water features. 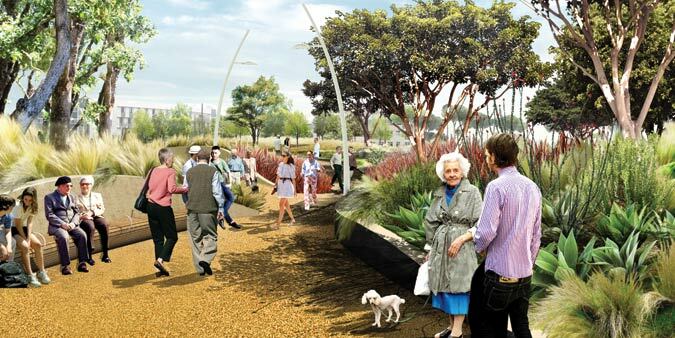 Adjacent streetscape improvements, as well as pedestrian and bicycle paths, will connect the parks to the city, while Moore Ruble Yudell’s Santa Monica Village will sit just adjacent. The city has committed $25 million for design and construction of the project, and construction is planned to begin in August 2011. Pier 11 in Philadelphia sits between Pier 9 and the Benjamin Franklin Bridge. Visions for a new Philadelphia waterfront took another step forward last month when the Delaware River Waterfront Corporation (DRWC) presented design finalists for the redevelopment of Pier 11, a run-down site along the Delaware River and the first phase of Philadelphia’s broader riverfront redesign plan. Selected from 26 proposals, the four finalists are James Corner Field Operations, Michael Van Valkenburgh Associates, and W Architecture and Landscape Architecture, all of New York, and Philadelphia-based Andropogon Associates. At a June 17 public presentation of the finalists’ designs, the proposals varied widely—some showing conceptual ideas and others laying out detailed, site-specific plans—but all offered ideas for a redefined edge. 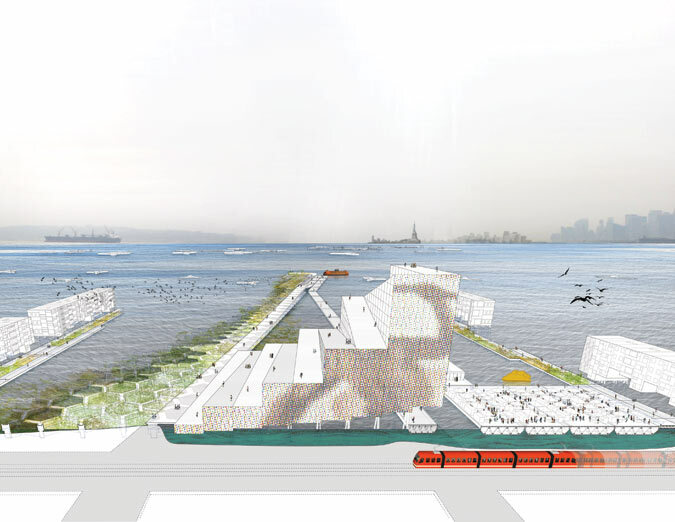 One of the most comprehensive proposals, developed by Andropogon Associates, transforms the existing pier into an ecologically engaging place powered by tidal, wind, and solar energy, with adaptive reuse of the pier’s historic structures. 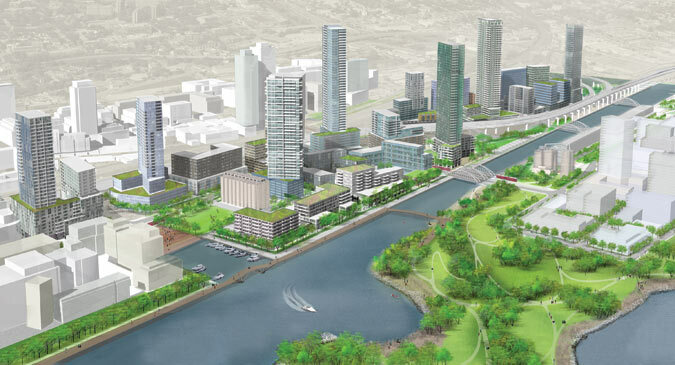 “It’s an opportunity to actually develop a paradigm shift in the way the city relates to the river, and how the river relates to the city,” Andropogon principal José Almiñana told AN. The proposal from Andropogon, the only team to offer a detailed rendering for the project in its presentation. The other finalists took a more conceptual aim at the project. Corner, principal at James Corner Field Operations, compared Pier 11 to his firm’s work on New York’s High Line. Both sites, he said, are underutilized areas that can be transformed into an economic opportunity for the city while providing a new public space for its inhabitants. 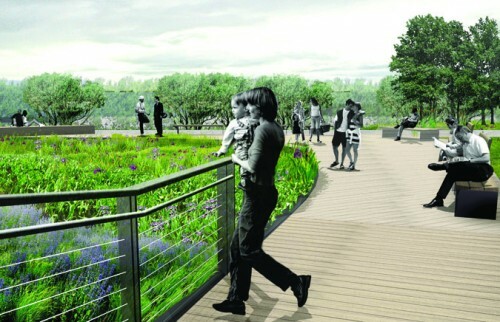 Van Valkenburgh’s presentation offered previous park projects, including designs for New York City’s Union Square and Brooklyn Bridge Park, highlighting the latter’s sustainable elements. 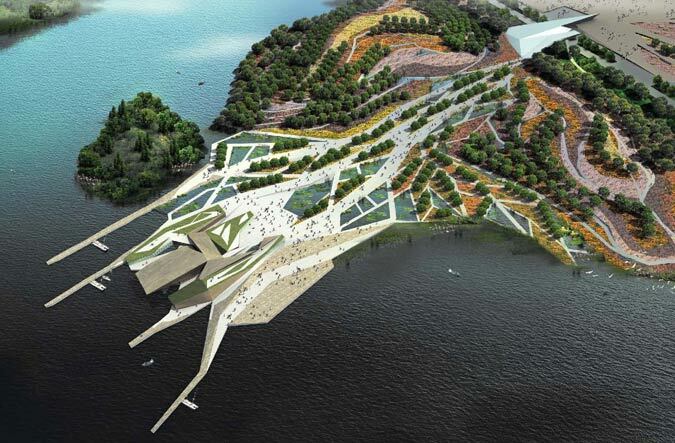 Lastly, W Architecture and Landscape Architecture proposed ideas based on the firm’s completed urban waterfront projects, emphasizing the interconnectivity of civic and natural environments. Built as a timber structure in 1916, Pier 11 was used by national and international steamers carrying fruit, salt, and cargo, but gradually succumbed to decay. 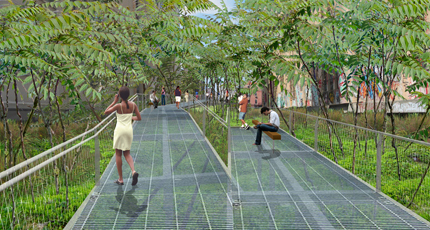 The 80-foot-by-540-foot strip at the foot of the Benjamin Franklin Bridge will “now bring a new look at public design along the waterfront, as well as a new way to reuse old industrial piers within the context of first-class public realm design,” said Joseph Forkin, vice president for operations and development at the DRWC. Eventual plans for the waterfront also include the reuse of Pier 9 and a former Water Department building. The DRWC’s planning committee, chaired by Marilyn Jordan Taylor, is expected to make its recommendation for the winning design team by July 31, and Forkin said he hoped an announcement would be made soon thereafter. At 22nd Street, the High Line's only lawn peels up to offer views of the skyline. The designers of the High Line revealed a scheme for the park’s second section today that channels the wisdom of a certain pop song: Beauty is where you find it. Corner said the straight nature of this section, due to open late next year at a cost of $71 million, let designers preserve the “melancholic” mood of the abandoned trestle more aggressively than they could in the curving southern area that Parks officials plan to open by the end of this year. As Corner described the new segment’s five “episodes,” he stressed a desire to leave the High Line as mysterious as it was before the renovation. A “thicket” up to 23rd Street carries pedestrians through clusters of plants that winnow the walkway. At 22nd Street, a wooden bleacher with a block-long lawn leads to an east-west vista and staircase with an elevator at 23rd (where the cantilever of Neil Denari’s HL23 skyscraper now appears only as a slightly bulging mass). At 26th Street, an empty billboard with a glass pane frames the seated public as they look straight up 10th Avenue. Then, between two bulky warehouses, the team proposes a “woodland flyover.” Replacing the tapered planks that define the rest of the walkway, this catwalk section stands on steel poles over a restored native grass patch. Finally, a “wildflower walk” guides pedestrians north toward the future Hudson Yards development. Burden cited the ambitious architecture going up along the Line as a payoff of the rezoning that made the park possible, but she reiterated that no Line-facing condo will get exclusive access to the park. “Design controls require five feet between the building and the Line,” she said. “It’s a moat.” Under carefully wrought provisions, developers must create public space within their buildings that buffers private use from the public park. In answer to queries about the city’s legions of joggers, Corner pointed to the nearby Hudson River Park as a place for active exertion, while Scofidio called serenity the High Line’s native genius. “Once you get up there, you stop because it’s so magical,” he said. 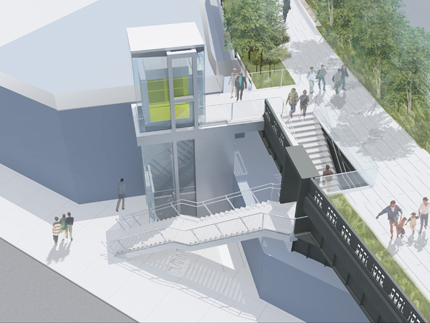 At 25th Street, a metal walkway allows dense groundcover to flourish underneath. 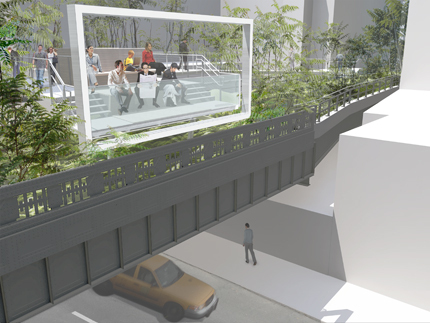 The 26th Street viewing spur shows off High Line visitors in a billboard-like frame. A wildflower field lines the walkway as it moves through West Chelsea. An access point intersects the High Line's curve at 30th Street.